Dividend Predictor tracks US and Canadian dividend paying stocks. Dividend Predictor is the essential tool for dividend investors that lets you know when you are getting paid! Track your dividend income, monitor changes and drill down on individual stocks. Download now and receive a free one month unlimited subscription. We are really happy to announce the release of a new version 4.0.0 of Dividend Predictor. This release adds recent price history to the stock details page, and greatly improves the subscription renewal process, along with many smaller improvements. Check it out! View your Portfolio and Dividend Payments on the web. Dividend Predictor allows you to track your dividend income providing you an expected cash flow for the coming months, quarters or year. See overall income and yield for your entire portfolio and by account, and how your income varies by month. Check the Changes page to show recent dividend increases and decreases in your portfolio, and what affect they have on your income stream. 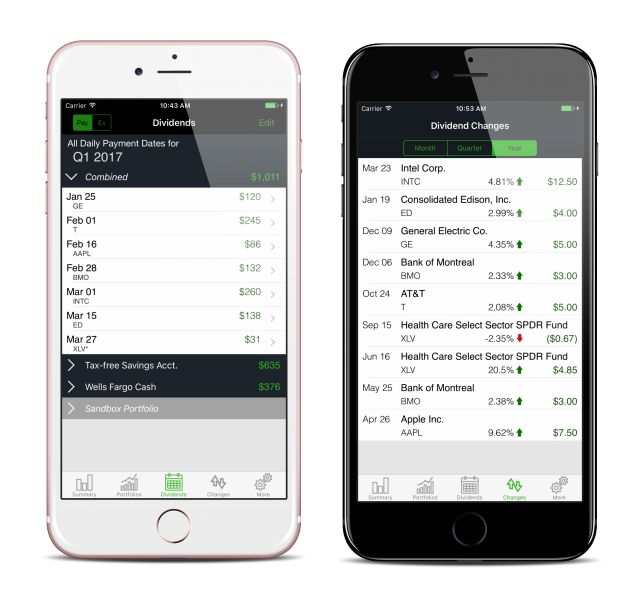 Along with an in-depth stock detail screen, Dividend Predictor provides a dividend history and recent dividend announcements to keep you on top of things. Fifth Third Bancorp Completes Merger With MB Financial, Inc.